Someone surmised that most of the world's progress has resulted from loneliness, as it provides the opportunity to cut adrift and find yourself. The process isn't without pain. In 1978, I lost my husband in the prime of life, Dr. C. B. Relfe, M.D., from leukemia. My live-in housekeeper of many years succumbed to bladder cancer in 1979. My only child, Anthony, my son, my son, was killed in an industrial accident May 13, 1980. In little more than two years all my immediate family was gone. There are no scissors to cut the cords of love or excise loneliness. "...Great is the mystery of Godliness." Bible Study, especially the prophe- cies and prayer for the spirit of wisdom and revelation, became my passion. The manuscript for When Your Money Fails, 666 was com- pleted in 1981. Seeking God about the publisher, He spoke: "Ministries, Inc. (formed in 1980) will publish it, and I will promote it...NO ADVERTISING." The impression was to immediately begin a sequel, The New Money System, 666, He would enable me to decode the Universal Product Code and discover all UPC symbols were framed with 666. Ministries, Inc. published it in 1982. Montgomery attorney, William Duke, prepared a Docu- ment signifying that I gifted Ministries, Inc. with all income from the book sales. Never have I received a dime for the sale of these (or any books) I've authored. The foolishness of God is wiser than the wisdom of man. The Lord spoke Current Events & Bible Prophecy to me in 1980. He spoke League of Prayer to me in 1985. 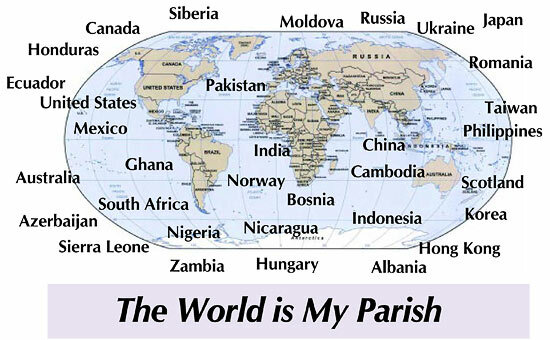 Had these divine directives been reversed, there would have been no financial resources to make the world my parish. League of Prayer - Russia was the first Christian Charity registered under Russia's amended constitution requiring 1/2 of the Board of Directors to be Russian citizens. Moscow Central Regional Hospital provided us an office and huge warehouse in exchange for medicines, equipment and supplies. We are now one of a few whose registration has not been revoked. Our initial meetings with the Moscow City Council, Human Resource Agencies, and Valentina Petlina, prominent attorney and Director of League of Prayer - Russia, gave us influence with City Officials and opened doors for multiple ministries. And one's loneliness will be ended. Through the past 26 years, God has inspired, occupied and dazzled my mind with His guidance in this work. Though we seemed small at our rising, with you behind us and God with us, methinks He will enable us together to attain such a meridian of usefulness that we shall appear resplendent at our setting. To God be the Glory!